Predictable and consistent procedures are key to a smoothly running classroom. Procedures are routines or step-by-step instructions for using materials, areas, and processes in the room. Procedures help children find and use supplies, know how to behave in different situations, and know what to do if a problem occurs. When children know exactly what to do they feel safe and secure, become increasingly independent, feel ownership of their classroom, and enjoy more time for learning. The goal of a procedure is not to achieve compliance and control, but to help children self-regulate their behavior in the classroom community. Create procedures with your children. Have them help you decide what procedures you need in the classroom. Teach children through mini-lessons using specific and consistent language so everyone understands what is expected. Discuss the importance of performing procedures routinely and give children ample time to practice. Plan, model, and practice procedures in the beginning of the school year and reinforce them throughout the year as necessary. The more procedures become rituals, the more time you and your children can spend on meaningful learning. Use this checklist to reflect on the procedures in your classroom. Create a list of procedures to teach in your classroom. Remember, different classrooms have different needs and the needs of your children may change as the year goes on. Here are some ideas to get you started on your list. List the materials that you expect children to use independently. Decide what you need to teach based on the list. Examples include: How to sharpen a pencil, how to return a book to the correct bin, how to use the word wall to check your spelling. Think about the different spaces in the room. What do children need to know to use them safely and successfully? Examples include: How to work in stations/centers, how to use the classroom library, how to sit on the rug. List processes and transitions children need to know how to do. Examples include: How to line up and move through the hallways, how to move from the rug to independent reading, how to work together in a small group. Reflect on your own goals and expectations for your children and classroom and use this information to choose which procedures to teach and when to teach them. The children will move smoothly through daily transitions. Teach the procedure for each transition. The children will solve problems during Independent Work Time without interrupting you. Create a routine for what to do when problems arise. Think about the challenges that your children encounter on a daily basis, specifically the ones that result in the loss of instructional time. The children argue over the furniture in the library each day. Establish a procedure for who gets to sit on the furniture and when (consider a rotating system). The children take a long time getting their materials out when they come in each morning, which delays the start of instruction. 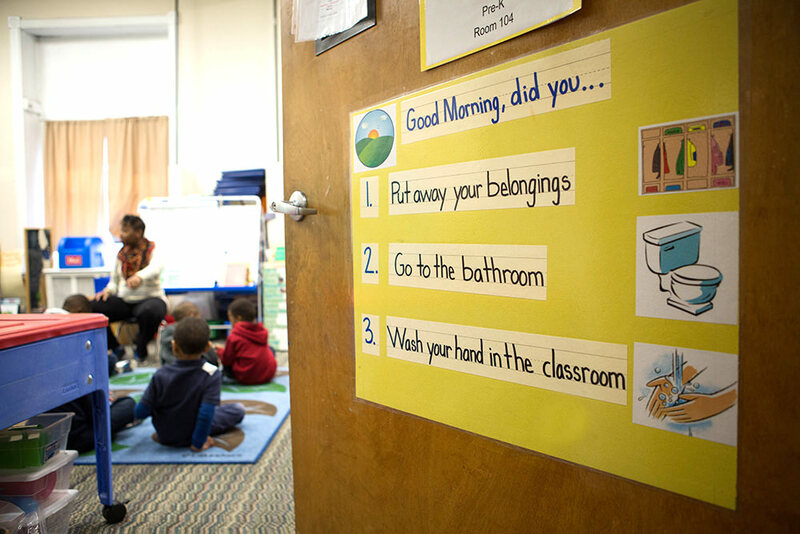 Create a morning routine for the children to follow as they enter the classroom each day. Procedures promote independence and minimize confusion and transition times. Here is a list of procedures to model and teach in your classroom. Look through the list to determine where you might need to create a new procedure or re-teach an existing procedure. How to use classroom supplies and materials such as paper, tape, art supplies, math manipulatives, white boards, markers, etc. What to do when you need the bathroom, a tissue, a drink of water, etc. Follow a consistent, predictable schedule so children know what is expected of them. Post and review the schedule each day. Make sure children are aware of any special happenings or changes that day. Model all the procedures around transitions you want the children to learn. Let them rehearse the procedures around transitions and give them plenty of time for practice. Prepare children for transition. Let the children know that a transition is coming. For example, you can provide a verbal cue such as “Five minutes until reading time is over” or you can use a nonverbal cue such as a rain stick or other pleasing sound as a signal. When transitioning, teach children relevant songs keep them engaged and also to signal how long a transition should take (the length of the song). For example, teach the children that singing the “Clean Up Song” twice while cleaning up after snack time should be all the time that is needed. Morning Arrival - Transitions for beginning the day should be clearly thought out and explained to the children. 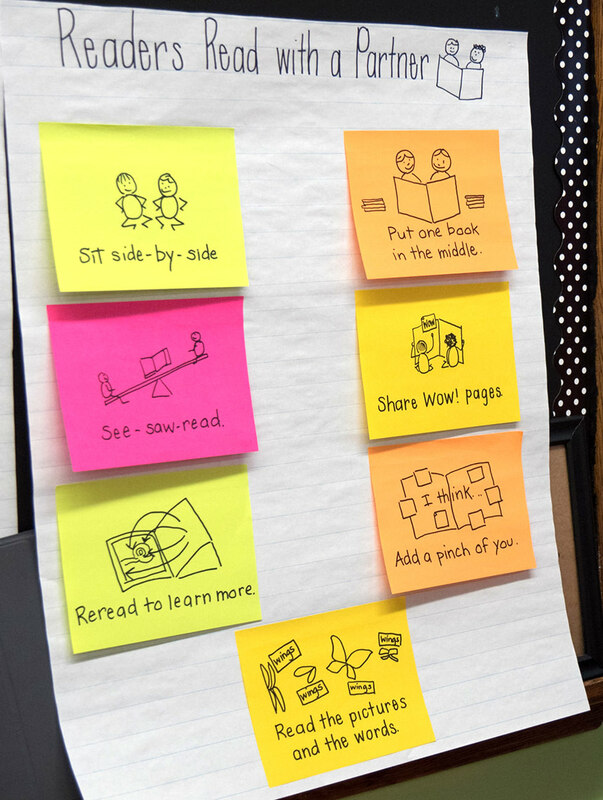 Anchor charts with photos or drawings of the sequence children should use to complete their morning tasks is helpful. Departure Time – This transition should also be regular and sequenced for the children. Expect them to do the same thing each time. Once they are ready to go, it will build community if you have a parting song or chant at the end of each instructional day. Or, you may choose to read a chapter from a chapter book. Lining Up – Children line up many times each day so it’s useful to make this transition swift. You might consider assigning line leaders and “cabooses” (the last person in line) as classroom jobs and also assigning spots in line. You may also consider asking the children to line up in engaging ways to make the transition fun and educational. You might ask the children with one syllable names to line up first and then two syllable names, etc. Try to match your line up requests with your current learning objectives. Support children who need extra assistance with transitions. This is a tricky time for many children (and grownups)! You can use photographs to help children know which activity will be next or how to get ready for the next activity. You might also give them individualized support such as a personal reminder or a transition buddy. The goal is to help children feel successful as you move them toward independence. Incorporate your children’s home languages to aid in transitions. Use some of the key words in their home language if this will help them know what to expect (e.g. words for “bathroom” or “lunch”). When you are teaching procedures, it helps if children know what they are learning and why it is important to the classroom community. They’ll need to see the procedure in action and have a chance to try it out. Use the following steps to plan and teach your procedures. Taking the time to carefully plan your procedures will result in more meaningful and clearer instruction later. Use a lesson plan template to write down what you will say and do with your children to teach procedures. Tell the children what you will teach them. Explain why it is important to the classroom culture. Demonstrate through modeling or role playing. Create, add to, or revisit an anchor chart. Give the children practice with the procedure. Assess their understanding to determine what you may need to re-teach or reinforce. Restate what the procedure is and why it is important. Ask questions to help children think about how this procedure will help them as learners. Add to the Power of Three. Use this template to guide your lesson planning when you are teaching procedures. This annotated version of our planning template explains each step of the lesson planning process. Here are a few sample lesson plans to teach responsibilities and procedures in your classroom. Feel free to adapt them to meet the needs of your children. This sample lesson helps children work independently in the classroom. This sample lesson teaches library responsibilities in the classroom. This sample lesson helps teach children to talk with a partner.